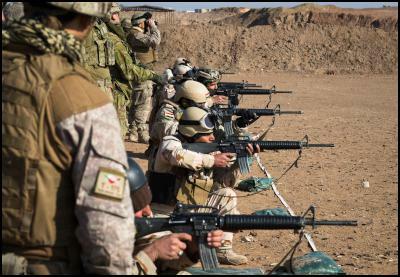 The fifth rotation of New Zealand Defence Force (NZDF) troops left today for a six-month mission training Iraqi soldiers. The NZDF’s Senior National Officer in Taji, Iraq, said the 106-member team was under no illusions about the task ahead. The mission-specific training that the NZDF contingent undertook in Townsville, Australia, in April had helped them integrate with their Australian counterparts, he said. The fifth rotation of New Zealand and Australian personnel that make up Task Group Taji are being joined for the first time by medical personnel from the Singaporean Armed Forces. On arrival at Camp Taji they will be joined by a contingent from the United Kingdom and will work alongside United States and Iraqi counterparts, who provide the camp infrastructure and security. Major General Tim Gall, the Commander Joint Forces New Zealand, said a lot had been achieved in terms of enhancing the combat skills of Iraqi Security Forces but the mission had become no less challenging. “Although Daesh is outnumbered and outgunned, continuing to build the Iraqi forces’ fighting capability through training is just as important now that they have intensified their campaign to expel the terrorist group from their country,” Major General Gall said. The mission will continue to be based at Camp Taji, where the majority of the training is conducted. However, members of the NZDF contingent travel regularly to other secure coalition locations to provide specific training to Iraqi soldiers with frontline duties. Since the training mission began in May 2015, Task Group Taji has trained more than 22,000 Iraqi Security Forces personnel. Many of the forces trained by the task group have joined the offensive to reclaim the western part of Mosul. Some are part of stabilisation forces who are trying to ensure that areas retaken from Daesh remain under the control of the Iraqi Government.